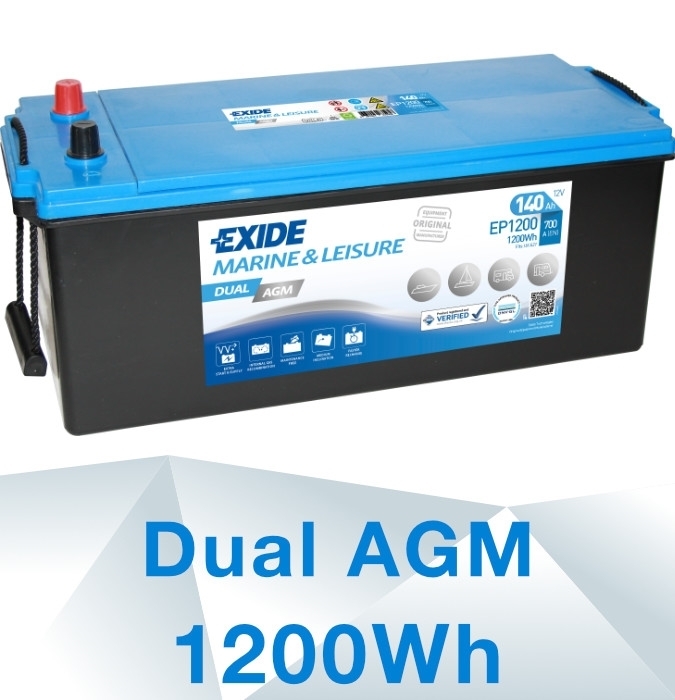 DUAL AGM is designed for use in modern motorhomes, caravans and pleasure boats. Their design offers a number of advantages such as flexible mounting, they can be mounted in confined spaces, they are spill and leak proof and the need for acid level controls and water refill are completely eliminated while keeping the storage stability exceptional. They are also manufactured in a robust design that can withstand vigorous vibrations. The batteries are made of AGM (Absorbent Glass Mat) technology with Ca / Ca alloy and are valve regulated. A battery with AGM (Absorbent Glass Mat) is a highly advanced battery where the acid is absorbed in the glass flare separators and never needs fluid level control. Most batteries need ventilation as well as isolation when installed in the vehicle, since during use they will give off a mix of hydrogen and oxygen gasses. By using batteries with internal gas recombination features, minimal gas emissions are regulated by the valve (VRLA), so special ventilation or isolation is not required. VRLA batteries can also be installed for locations like inside the passenger room or under the driver seat. Traditionally, batteries require periodic inspections for water topping up, cleaning and recharge. This is sometimes arduous due to access difficulties, lack of time or inexperience. By using batteries with “maintenance free” features, time dedicated to maintenance will be drastically reduced because there is no need to inspect electrolyte levels or to clean spillages. Self-discharge is also extremely low during resting periods, reducing the frequency for recharges. The engine alternator usually recharges the battery during driving time. Nevertheless, to keep batteries at a full state of charge, you can undertake complementary recharges by using chargers plugged into the mains during parking time. 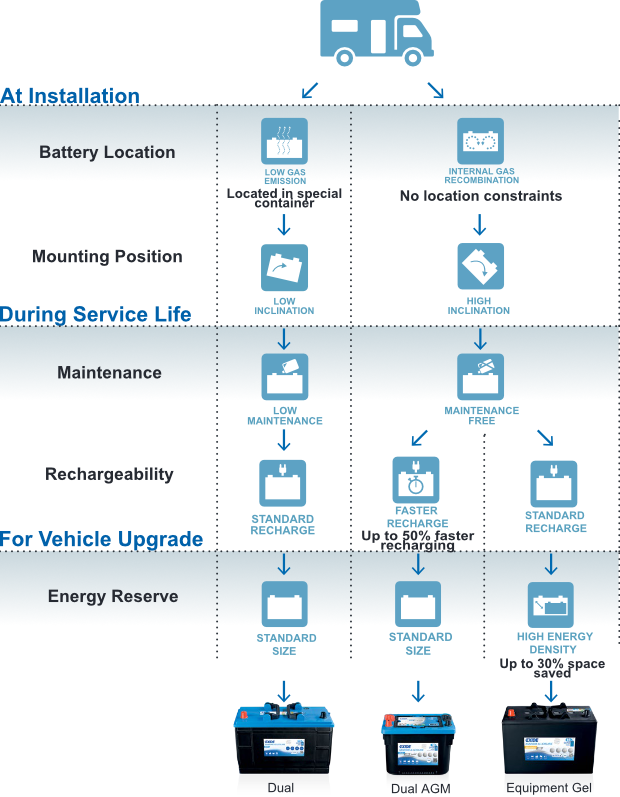 By using batteries with “faster recharge” features (together with efficient chargers), you can reduce the time needed to complete a full recharge by up to 50%. Also, recharge from the alternator will become more efficient. 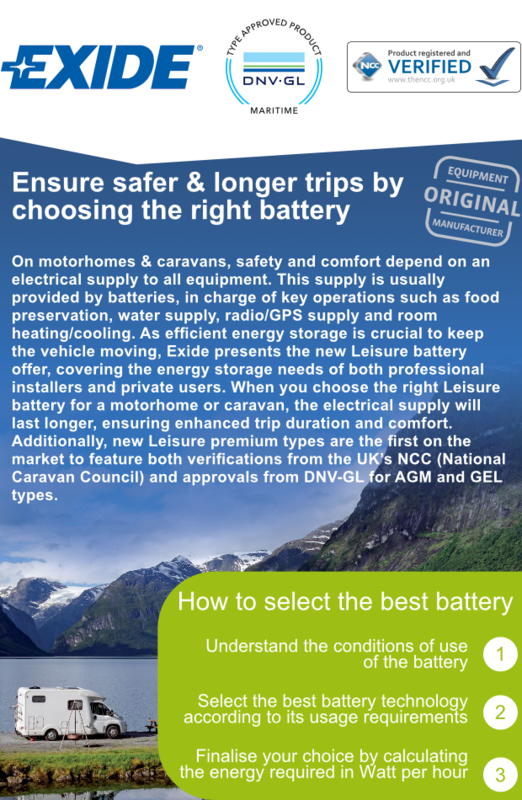 Batteries fitted to motorhomes or caravans have the capacity to provide the total amount of energy (Watt x hour) required for a trip. 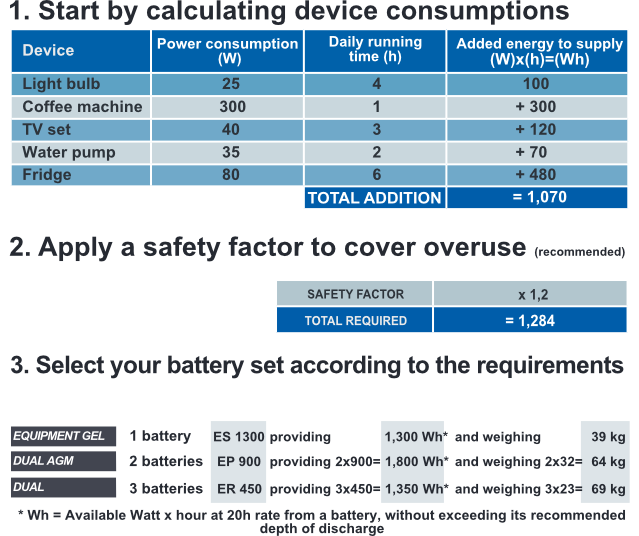 So when new equipment is installed or longer trips are foreseen, extra capacity will be needed to supply enough power. However, room for extra batteries is usually limited, so extension is not feasible. By using batteries with our “High energy density” feature, room dedicated to batteries can be optimised, as either more energy will be stored in the same volume, or the same amount of energy will require less volume, providing a space saving of up to 30%.